Place vegetables in slow cooker; top with chicken. Mix pasta sauce and dressing; add to slow cooker. Cover with lid. Stir basil into ingredients in slow cooker. Drain pasta. Serve topped with chicken mixture and cheese. Chicken thighs are ideal for cooking in the slow cooker since they are juicy even after the long cooking time. 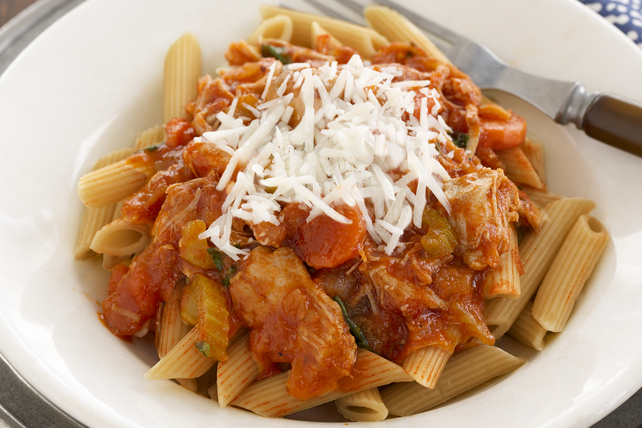 The whole wheat pasta and chicken team up to provide an excellent source of iron in this flavourful slow-cooker meal.